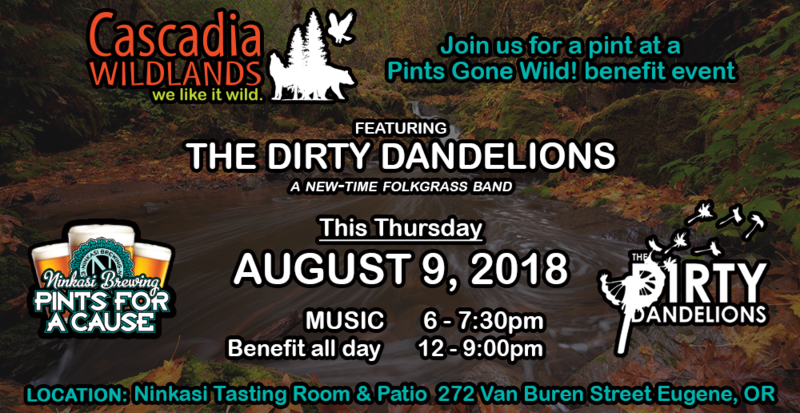 Join Cascadia Wildlands for the 2nd to last Pints Gone Wild! event of the year! WHERE: The Ninkasi Brewing Tasting Room, located at 272 Van Buren Street in Eugene’s historic Whiteaker neighborhood. Local band The Dirty Dandelions will dazzle and delight with their new-time folkgrass sound; complete with banjo frailing, flatpickin, fiddle-stomping, washtub bass, and sweet three-part vocal harmonies. They’ll be playing original tunes that inspire social change as well as traditional favorites. Cascadia Wildlands staff and volunteers will be at our outreach table with some of our sweet swag in hand. Pop by for a beer or two, grab some dinner at a local food cart, get yourself a tie-dyed wolf bandana while you can, and check in about our current conservation campaigns. Pints Gone Wild! is an all-day “Pints For A Cause” benefit event at the Ninkasi Tasting Room where $1 of every pint sold there is generously donated to Cascadia Wildlands to support a wide range of the organization’s conservation work, including designating the Devil’s Staircase Wilderness in the Oregon Coast Range, securing Gray Wolf recovery in the Pacific West, protecting wild salmon, and ensuring our public lands stay in public hands. The event is ADA accessible, free, and open to the public.